The 3rd Marine Aircraft Wing was commissioned on the 167th anniversary of the Marine Corps, Nov. 10, 1942, at Marine Corps Air Station Cherry Point, N.C. with a personnel roster of 13 officers, 25 enlisted men and one aircraft – a trainer. The Wing’s combat history began with the World War II deployment of a bomber squadron on Dec. 3, 1943. A little more than a year later, the Wing deployed a night fighter squadron in support of the war effort. On Apr. 21, 1944, the Wing boarded three carriers for a voyage to Hawaii and arrived May 8, where it assumed the functions of Marine Air, Hawaii Area. When the Japanese surrendered, 3rd MAW was decommissioned and its personnel were assigned to other units. The Wing had played an important, but behind-the-scenes, role in defeating the Japanese by giving the best training available to Marine pilots and support personnel. In September 1955, the Wing left Miami for Marine Corps Air Station El Toro, Calif., and was rebuilt again, with the addition of Marine Aircraft Group 15, followed by Marine Aircraft Group 36 with its helicopter squadrons at a nearby Air Station in Santa Ana, CA. Wing squadrons were detached and deployed to Vietnam as combat action in Southeast Asia flared. At the end of the Vietnam War several units were brought back to the United States and deactivated or redesignated, creating the 3rd Marine Aircraft Wing of today. The Wing saw action again as part of the I Marine Expeditionary Force, conducting operations in Iraq and Kuwait during Operation Desert Shield/Storm/Saber. After the end of hostilities, 3rd MAW aircraft provided support in Operations Provide Comfort and Southern Watch over Iraq. The Wing was once more called into service in Somalia for Operation Restore Hope. The fall of 2001 would reveal a new type of warfare, the War on Terror, and 3rd MAW answered the call again deploying several detachments in support of the ongoing Operation Enduring Freedom. In the fall of 2002 the Wing began deploying to Kuwait to prepare for combat operations in Iraq. 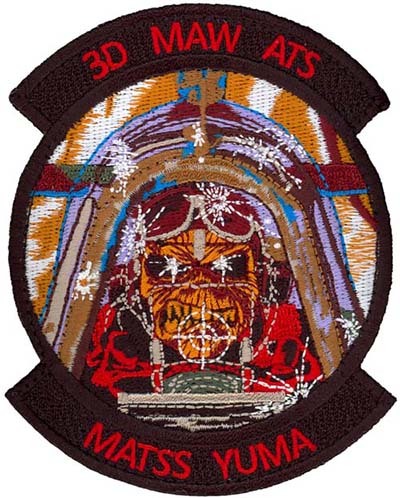 The Third Marine Aircraft Wing supported I MEF and coalition forces in liberating Iraq and toppling Saddam Hussein during Operation Iraqi Freedom. The 3rd MAW has a well-proven, colorful battle history and today’s Marines stand ready and prepared to meet the challenges of the ongoing War on Terror. ADVTE is a persistent, encrypted, closed-loop state-of-the art system of systems that enables tactically relevant training. ADVTE links more than 40 Marine Corps aviation trainers located at Second and Third Marine Aircraft Wing (MAW) Marine Aviation Training System Sites (MATSS) and provides the capability for geographically dispersed Marines representing multiple types of aircraft platforms to link together for simulated mission rehearsal training events. A primary component of ADVTE that acts as the “hub” of networked training events is the Network Exercise Control Center (NECC), located at Second and Third MAW MATSS. Each NECC is a secure space where all connected simulators are shown on large visual displays. The NECC supports and enables training event planning, real-time event coordination and control, visual and audio monitoring of simulator activity and brief/debriefing capability to include event playback. Interoperability via the NECC ensures training is secure and maximizes the probability of the mission’s success. Employing ADVTE to conduct linked training representing multiple aircraft device types significantly enhances training realism and combat mission readiness. It provides the opportunity to perform and develop additional training and readiness events in aircraft simulators. Utilization of the capability reduces the costs of training when compared to using aircraft, while increasing the availability of aircraft for actual mission operations. ADVTE provides aircrew personnel with the capability to train together in virtual environment(s) representing geographical areas and environmental conditions they may encounter when deployed. Aircrew can perform simulated air-to-air and air-to-ground combat missions scenarios, as well as joint exercises. Tactical strategy can be simulated and emergency situations can be instituted in a safe environment. With the ADVTE, aircrews hone communication skills and achieve mission proficiency and effectiveness prior to operating aircraft in the real-world environment. H-1 training systems provide a full range of high-fidelity training devices and comprehensive curriculum required for Marine Corps H-1 aviators, aircrew and maintainers. All training devices and materials support the Marine Corps training and readiness syllabus. The AV-8B Training System includes Weapon System Trainers (WST), Multi-Task Trainers (MTT), and Maintenance Part Task Trainers, as well as maintenance and pilot curriculum. The WSTs share a common hardware and software configuration, have a fully replicated cockpit and represent the operational flight program capabilities currently in use on the aircraft. The MTTs and maintenance trainers will soon be replaced or modified to increase capabilities and address obsolescence issues. H-53E training systems provide a full range of training devices and curriculum required to support H-53E pilot, enlisted aircrew and maintenance training and proficiency across the full spectrum of missions as executed by the H-53E. Products include pilot, enlisted aircrew and maintenance training devices and simulators. The EA-6B Prowler training systems provide the full range of high-fidelity training devices and comprehensive curriculum required for Marine Corps aviators, electronic countermeasures officers and aircraft maintainers to become proficient in every facet of operation, employment and full maintenance procedures of EA-6B aircraft Systems in support of deployed U.S. forces. The KC-130 training systems are designed to teach Marine Corps and Navy pilots, co-pilots and aircrew how to fly the multi-role, multi-mission C-130 tactical tanker/transport aircraft. The simulators and curriculum provide training to include takeoff/landing procedures, emergency medical evacuation, aerial refueling, and emergency evacuation of personnel and key equipment. While device upgrades to software and hardware allow us to meet the pilot training requirement, having the most accurate equipment and most realistic scenarios is crucial to maintaining fleet readiness. These improvements create a more realistic visual training environment, increasing the type of training that can be performed and the effectiveness of all training scenarios. The MV-22 Osprey training system provides a full range of high-fidelity training devices and comprehensive curriculum required for familiarization and proficiency by Marine Corps personnel. The courseware consists of current, responsive Advanced Distributed Learning and Interactive Multimedia Instruction materials for pilots, aircrew and maintenance personnel. The unique curriculum is housed on the Marine Corps Aviation Learning Management System, an MV-22 developed initiative that also stores courseware for other Marine Corps platforms. Use of the Integrated Training Systems (ITS) Web Tool increases safety through standardization and enhances mission effectiveness through the early and continuous identification and mitigation of risk. Concurrency Management is sustained on the ITS Web Tool and provides early and accurate response to aircraft-driven changes, revisions to source publications and warfighter-requirements. The process enables efficient management of the 32 aircrew training devices and 15 maintenance trainers. Time-critical and tactically relevant Differences Training is developed and delivered by the Fast Response Group. The VH In-Service training system provides a full range of medium to high-fidelity simulated flight training devices for two Type/Model/Series aircraft, VH-3D and VH-60N, which are critical assets to the Marine Corps executive lift mission. These flight training devices provide the pilots of Marine Helicopter Squadron (HMX) 1 with the necessary capabilities to conduct Naval Air Training and Operating Procedures Standardization checks, proficiency, precision and emergency procedures training where the use of an actual aircraft would limit their training capabilities. The RQ-7B Shadow UAS is supported by simulators at garrison sites in the U.S. The training devices replicate ground stations used by UAS controllers and provide a fully interactive system simulator.